Caramel popcorn, or caramel corn as it is commonly known, is a confectionery treat enjoyed by millions every year. 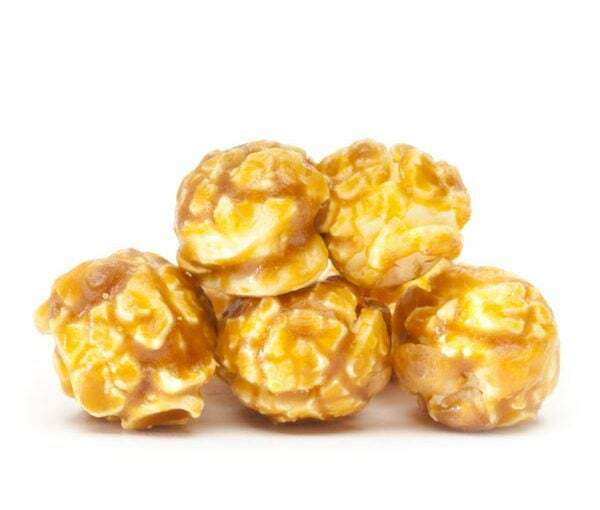 Caramel corn is popcorn that is coated with a sweet, caramel candy coating which gives the snack its signature crunch. Americans definitely have a love affair with sweet and crunchy caramel corn and the treat can be found in gourmet popcorn stores, on grocery market shelves, and is easily made at home! So how exactly did America get hooked on caramel popcorn? We can actually trace caramel corn’s history back to the 1800s. While caramel corn surfaced in the late 1800s, sweetened popcorn had been around for years prior. In fact kettle corn, which is popcorn cooked in oil with both sugar and salt was referenced in historic accounts by the Dutch who settled in Pennsylvania in the late 1700s. Kettle corn was often made for special occasions, holidays, and fair. While the sweet and salty kettle corn was a popular treat for a large part of the 19th century, it was until the 1870s when caramel corn was introduced. Two German brothers, Frederick and Louis Rueckheim immigrated to the United States and settled in Chicago. There they opened a popcorn store in the 1870s and began experimenting with different flavors and toppings. They introduced a new concoction that was a mix of popcorn, peanuts, and molasses that quickly became a hit. After someone who sampled the product exclaimed “That’s a crackerjack!” (which at the time meant “of great quality”), the name stuck and in 1896 the brothers registered Cracker Jack ® and began mass producing the snack. The success and popularity of the molasses coated Cracker Jack led others to experiment with different types of syrups and coatings to put on popcorn, which is when the caramel corn craze really took off. Today, caramel corn is traditionally made by mixing a sugar solution (or sometimes molasses) and heating until the sugar caramelizes and it turns to a golden-brown or brown color which is then either drizzled over popcorn or mixed all together. Caramel corn is often sold as a standalone product, however there are varieties that also mix in different types of nuts including peanuts, almonds, pecans, and cashews. Caramel corn is also one of the biggest sellers as a popcorn tin flavor. Often given as gifts for the holidays, popcorn tins feature a variety of flavored popcorn sold in a large, collectible tin. One of the most popular types of popcorn tins (sometimes referred to as the “traditional” popcorn tin) contains caramel corn, butter popcorn, and cheddar cheese flavored popcorn. Caramel corn is a great treat and an alternative to candies and pastries for those with a sweet tooth looking for a snack! Previous Previous post: Cheeseburger, Cheeseburger, No Coke, Pepsi!